From my early years, I’ve always been drawn to contradictions. The ancestral horse and cattle ranch where I was born and spent my early years rests on a relatively flat, mile-high calderic sea of sage and pine-covered lava in the western shadows of the Tetons. Intrigued by its three namesake peaks, I was always drawn far more to the east through the pass to Jackson, Wyoming than I was to either Bozeman, Montana, north across the Centennials, or down on the Snake River plain to Idaho Falls. Many who know only Jackson Hole, the valley anchored at one end by the town, may think that by contradictions I am referring to the contrast with the much more traveled but rather bleak route along the southern edge of that state running from Cheyenne to Green River, which is punctuated only by the beauty of the 7,100-foot-high valley surrounding Laramie (not old Fort Laramie) nestled between two mountain ranges. Those only familiar with these two areas miss the rugged beauty of that state’s north central region where it is dissected by the Wind River and Big Horn ranges. They seem to point just south to the North Platte and Sweetwater Rivers described in the June 21,1847 diary entries by my great-great grandfather Charles Harper as he passed by Independence Rock and through Devil’s Gap, both shown in the 1850 rendering at this link. 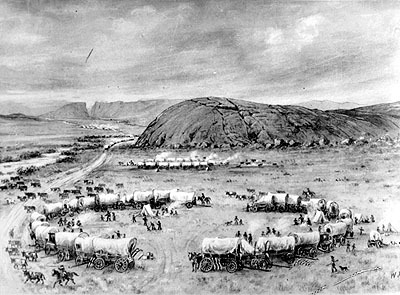 Less than ten days earlier, he and others in their Mormon party had helped 22 wagons of other emigrants along the Oregon Trail on several river crossings and then “dug out two large canoes and lashed them together to make a ferry” that could carry the wagons across for those to come. Six days later, this small vanguard of Mormons would crest the Western Continental Divide at South Pass. Harper was a former carriage-maker and Quaker who worked as a wheelwright or mechanic on that journey. He would make several repeat trips, eventually captaining a train of wagons many times larger than the one in 1847. He also later raised livestock, but couldn’t have foreseen as he crisscrossed the North Plate River and built that ferry near what would become Casper, Wyoming, that one of the great tragedies of class warfare would take place in Johnson County, an hours drive north today, which at the time embraced both sides of the spectacular Big Horn mountains as well as incredible range land. The then-looming Civil War period marked several subsidiary events that dramatically affected places such as Wyoming - part plains and part Rockies - including the Homestead Act of 1862, the proliferation of railroads and a post-war surge in the demand for beef in the diets of Americans. In 1869, the Wyoming Territory became the first to grant women the right to vote, partly some think as a means to draw more women to even out the 6 to 1 imbalance of men to women there. It began a long line of Wyoming firsts including Yellowstone, the first national park in 1872, Shoshone, the first national forest in 1891 and Devil’s Tower, the first national monument in 1906. During the drive to statehood in 1889, conservative Republican officials there, along with allies in the US Congress came close to eliminating women’s suffrage in Wyoming, but Wyomans would not be denied. Even with only men voting, inclusion of suffrage in the state constitution passed by two-thirds as the soon-to-be state drew a “line in the sand” as a condition to joining the Union. Ironically, during this same span, wealthy and politically connected land and cattle interests in Cheyenne, enabled by Republican officials, waged a war on small cattle growers and emigrant homesteaders in Johnson County. Feeling immune from law, the large cattle interests placed bounties on more than a hundred individuals under the subterfuge of rustling claims. They then hired Texans in Denver to help carry out the executions until a stalemate was reached in a bloody shootout along Crazy Woman Creek, which was broken up by the U.S. 6th Cavalry Regiment. Skilled at public relations and with sycophants in the news media and elected office, the large land and cattle interests took a page from white Southerners at the time and quickly painted themselves as heroes and victims who took the law in their own hands. Johnson County was put under martial law but Wyomans there objected. The most balanced and factual account is found in the 2010 book by John W. Davis entitled Wyoming Range War which I read during cross-country trips that year and the next. The author was born and practices law in Johnson County today. To traverse this dramatic area one can either take a detour off I-80 west and cut up through old Fort Laramie and then north from Casper on I-25 eventually connecting to I-90 at Buffalo, the Johnson County seat. Davis’s well-researched account adds dimension to artistic references or versions of the Johnson County War in classic western novels-turned-into movies such as The Virginian (also a 1960s TV series,) Shane and True Grit and the soon-to-be re-released 1980 Heaven’s Gate. The range war was also the subject of songs such as the 1989 classic by the late country music legend Chris LeDoux who settled with his family in Johnson County after his world champion rodeo career and became a prolific song-writer. 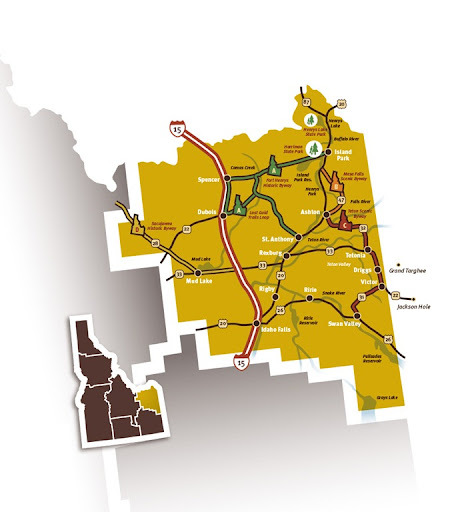 However, my favorite route is from west to east, starting in my native nook of Idaho, via either I-15 or I-90 then either cutting over to Jackson and up through Yellowstone to US 89 or taking US 20 north from Idaho and into the park to connect with US 89. From there head up and across the spectacular Beartooth Highway and then drop down to continue through the Big Horns on US 20 or connect to I-90 east below Billings, Montana. From there, drive down through the Battle of Little Big Horn and along the Big Horn Mountain range through Johnson County to Buffalo. Either way, be sure to stop at overlooks near Buffalo for spectacular views of the Big Horn mountains. This is a good place to contemplate a time when fear of class equality lead to such extreme measures and tragedy. Big land and cattle companies were common throughout the Intermountain West at the time. It was likely that either newspaper ads for the 1888 Arangee Co., which established a colony for Swiss settlers stocked with imported Holstein cattle, or perhaps the 1898 homestead that became the Island Park Land and Cattle Co. may have influenced my paternal great-grandparents and grandparents to homestead in Fremont County, Idaho just a few years after the Wyoming Range Wars. My ancestors were among the first to settle Cache Valley in Utah around 1860 near the town of Richmond, through which stage coaches soon carried supplies north to gold miners. The drivers would have also carried word about ranching and homestead opportunities in what would become Fremont County in the shadow of Yellowstone and the Tetons as Idaho achieved statehood. The period of the 1890s was filled with social unrest, contradictions and class distinctions which fueled events such as the Pullman Strike. Cowboys also went on strike in Wyoming. A few years after statehood, the populist Idaho governor Frank Steuenberg was killed by a bomb rigged in front of his house by a miner following his declaration of martial law during strikes over poor working conditions. Unrest and inequity also helped invigorate the emerging Progressive Era which was marked by the social and environmental policies of Republican President Theodore Roosevelt who stood firm to those in his party in support of fairness and the Square Deal. The Johnson County range war was preceded by a long depression and a dramatic fall off in the price of cattle. Small cattle growers like my ancestors and eventually my parents, not only helped expand the middle class but they were a threat to the 1 percenters of that day and age. Adding to my list of contradictions, as the Wyoming range wars raged and women there fought to keep their right to vote and westerners such as my ancestors homesteaded ranches in Idaho, stage coaches of vacationers passed just north of the ranch. They carried wealthy Americans and Europeans from the railhead at Beaver Canyon (just north of present-day Spencer) on a four-day, 100-mile trip to see Old Faithful geyser in Yellowstone Park and back for $130 including meals. Advertising by Union Pacific Railroad drew these tourists, who could stay an additional five days and take “observation” coaches on a 150-mile loop tour of the park for an additional $150 catching a return stage coach past what would be the ranch of my youth, to catch a return train at Beaver Canyon. Horses for these stage coaches were wintered first in Cedar Fort, Utah where another maternal great-great grandfather had settled and raised a family after mustering out of the U.S. Cavalry after the Civil War. Later the horses were wintered in Cache Valley whose tenders may have been another source of inspiration for my paternal great-grandparents to homestead ranches in Fremont County, Idaho. This all took place only 15 years after the Nez Perce Indians (numbering 700 including 200 warriors by then) under Chief Joseph, fought the Battle of Camas Creek along this stretch north of my ancestral ranches. It was then a hunting and trading path that stretched as far as the Big Horn mountains in Wyoming. Chief Joseph’s warriors were fighting running battles with the much larger U.S. Cavalry under General O.O. Howard along what would be a nearly 1,200 mile route that ended just short of safety in Canada. In 1893, the year after the Wyoming Range Wars, Dr. Frederick Jackson Turner presented his famous paper marking the end of the American frontier at the same exposition in Chicago that inspired the evolution of community improvements for destination marketing, the arts and planning. But judging by today, we’ve drifted back to an era of gross inequality.